Good choice to run in risers or under floors. Construct from finely stranded conductor to IEC 60228 class 5 make the installation simpler and easy to route. Cores identification is based on BS 7671 up to 5 cores. Operating voltage is 0.6/1kV and complies with regulations for power cables in protected installations. Used in wiring to computer systems; lift shafts, HVAC, security systems and BMS. 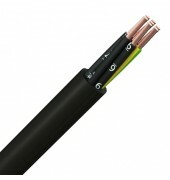 Fine copper wire strands to IEC 60228 class 5, XLPE insulation, cores laid up. Low Smoke Zero Halogen sheath, black.